There’s always some sort of new dress to create, it seems. Mmmm…….something about a sweet new dress though. Good thing my little lady loves to wear them. And perfectly adorned with some little satin flowers. I found this sweater at the thrift store in great condition and decided to re-purpose the lifeless thing. Then I sewed the sides of the dress together with rigtht sides still together. Then I used the sleeves of the sweater to create my new sleeves. Measure the length you’ll need by measuring the shoulder to the wrist of your little girl. You’ll have to cut the sleeve to be more narrow (depending on the size of your little girl’s arm) and then angle it at the top, where it will attach to the dress. Then, sew the raw edges closed with right sides together, so that you now have a tube….or your sleeve. Attach the sleeve to the dress by pinning it all the way around while the dress and sleeve are still inside out but you’re pinning the edges together with the right sides together…….and with the seam on the bottom, matching with the side seam of the dress. If you need better step by step directions for this concept, refer to this tutorial here. Turn right side out and embellish however you’d like. I saw these cute little satin flowers here. All you do is cut out circles of satin in different sizes and use a lighter to melt the edges…and keep them from fraying. Stack them up, put a button or a bead in the middle….or leave it plain and stitch them in place. Attach to your dress for some extra cuteness. And then cozy up that little lady in her new sweater dress and let her do her thing. This is so cute. I have seen so many ladies repurpose old shirts, etc. in to some sweet outfits for their little girls. Too bad my daughter is in college. I would have fun making stuff like this for her. There are some truly awesome humanitarian sites that would LOVE to have children’s clothing. If you have the skills and would love to sew something like this, please look them up online. If you can’t find some in your area, there is for example “Little Dresses for Africa” (who also take items to other places too) and the “Sew Powerful Purse Charity” just as a few ideas. Oooh! I can't wait to get started on this! I have the perfect sweater for this! Thanks for the tute! you know, i have 4 kiddos and we live on a very small budget so thrift stores are the only place we buy clothes. re-purposing is genius! i can pick a sweater up for 25 cents at my favorite thrift shop and both my girls are going to love these! thank you for being so creative and sharing it with us. Sooo cute! Love it and the flowers are so pretty! Oh my! I love it! I've been wanting a sweater dress for my little one but was refusing to pay $20 for one that would end up stained in a minute. Great idea! Oh, and I really like your new header, by the way. Have a great day! Great idea! My husband put a sweater in the Goodwill box recently. Maybe I'll go dig it out and see if it will work for Kaitlyn. This was just sooo cute!!! I had to make it too! And so I did. This was the very first piece of clothing I have ever made for my daughter! This will be her special 2yr Birthday dress!! I am just sooo excited and it turned out GREAT!! Thanks a million! Where did you get her cute leggings? I've been coveting the sweater dresses at Target… now I don't have to pay to get one, I have the perfect sweater! What size shirt do you typically start with? That came just in time! I have a whole stack of sweaters I was giving away because they no longer fit! Now I can try this out instead! Thanks! I got her leggings at Old Navy, I think, on clearance last year. As for the size of sweater, I think this was a large. But the most important thing is not the size……but look to see how long it is. Measure from the neckline down to the bottom of the sweater to see if that will be long enough from the neckline down to the knees of your subject. Some XXL sweaters are short and still won't work but there will be some Medium sweaters that are long and will work fabulously. SO, just measure the length of the sweater. LOVE LOVE LOVE THIS. I need to go through my closet and find a sweater like this. Too cute. SO CUTE! WISH I HAD A GIRL…2 BOYS WOULDN'T ENJOY THIS..DANG! I am always amazed at your creativity! This is the cutest dress! I had a bag of old sweaters that didn't fit and I'm going to go scrounge around in it instead! oh MAN I wanna try this!!! Thanks for the idea!!! I am so doing this!! I have several old sweaters and I have wanted to turn them into dresses for Elle, but just could not come up with an idea on how to go about it. This is awesome!!! Thank you! Just wanted you to know that I nominated you for a Blog Award. This is just fabulous! WOW! thanks for sharing. I was just looking for a tutorial like this earlier today. I have four sweaters that are just begging to be made into dresses. Thanks! This is so funny and convenient, I just bought some sweaters at DI to make into dresses. Thanks! Wow adorable dress!! Completely seemless! That is so simple and cute. I will have to try that. Thanks for your tutorials. They are always so creative. Very cute idea. If I followed all your ideas, I'd never have to buy clothes from retail shops ever again! I love sweater dresses. Just charming. I love this dress! So cute! I'm going to have to visit my local thrift shop soon to try this. WOW! That is absolutely adorable! I need to add this to my list of things to make for my girls. Thanks! This is so cute! What talent you have & I love that you added the flowers to the dress! This is sooo cute! Thanks a lot for sharing! What a great idea! I just made this for my little one with an old sweater of mine. What a great idea! The only change I made was to make the sleeves first and then cut the sleeve holes so that I could get a really good fit. omg she looks adorable in it!!!!! what a great idea! you should rummage through all your old tees and sweaters. you could make so many dresses for her! I want to know how to make those lovely pink flowers!! So cutE! I just made a dress earlier this month that is THE EXACT same, except the little flowers, I did a bow. So funny!! I LOVE this! I saw the cutest sweater dresses at Target, but I'm so cheap I couldn't bring myself to spend $15.00 on it since I make most of my daughters dresses. I'm so hitting up the DI tonight to see if I can find a sweater that will work! So cute! I love the flowers. All very clean and fresh. This is so adorable. I linked up to it on my Simply Doing Something Blog so all my friends could see! Thanks! Thanks for yet another inspiring remake – my little one now has another dress! I hesitated to get rid of a sweater (too short for me) but this was the shove I needed to actually cut it. Love it! Thanks for such a fun, fashionable and frugal idea. That's adorable! Can I blog about your tutorial? I would of course link back to your blog. Kris, sorry it took me a while to get back to you. Yes, you can link. No problem!! You young mothers are just so creative! Now if only we could get new adopted daughter 2B home! I just made a sweater dress thanks to your wonderful tutorial! I found an ivory sweater at the dollar store. How awesome is that? Thanks for this great post. I had just cleaned my closet when I first read it and quickly snatched those too sweaters back out of my DI pile. I'm so glad I did. My daughter loves her new dresses and I still can't believe how easy it was. THANKS! I whipped one of these up today during naptime! Thanks! I saw this and the t-shirt dress you made your daughter. I always have trouble sewing on these types of fabric because they stretch and become mis-shaped. Do you have any tips? Rhonda, yes, sewing on knits or even sweaters can be a bit tricky sometimes. Making a bigger stitch helps me a ton. Also, using a zig-zag stitch helps keep it from stretching while I'm sewing. Thank-you so much for sharing this! I just finished making two for my daughter. Thought I'd let you know I ended up making one. And I love it. She loves it. I am begging the hubs to let me chop up his red sweater! I made this today from an old colorful striped Gap sweater-and it is ADORABLE! Not the right season, but we're working on school clothes. I LOVE this! Making a few more to go with tights and boots! Thank you so much! I just bought a new sewing machine (for my 12 birthday my grandma chipped in) i was looking for a new project to try out it with, i tryed this from a goodwill sweater for my little sister, it turned out adorable! I have a question, I have a lovely sweater that I wanted to turn into a dress for my little girl, but the reason I don't want it anymore is because at a hair appt. once it got bleach spots around the neckline. Is there a good way to make a new neckline, or anything else I could do, or would it be best to just scrap the idea? I love this. I had two handknit lambswool/angora sweaters that a friend gave me that were shrunk. I can't fit them, but after about 30 minutes of cutting and sewing one is a dress. thank you for posting this tutorial, it gave me the inspiration to make a few for my little girl. I have posted about my tut on my blog. OMG! I have been wanting to buy one of these for so very long! Now i don’t have to!!! This is so often. found this page today and will most definately be stopping by OFTEN!! I am so thankful for Pinterest! I subscribe to your blog, but hadn’t seen this post because it is older. I had one question – could you attach the arms before you sew up the side seams? I seem to have better luck with attaching arms this way. Thanks! And thanks for this tutorial, I LOVE it! My Mom gave me some sweaters she doesn’t wear anymore, this will be a perfect way to put them to use! Scratch that question! I’m already working on it and I think I’ve figured it out! Thanks! This came out so cute! I’m trying to envision what you’re describing for making the neck opening smaller. I’ve been wondering if I could do this with shirts that are too open at the neck, but I guess it would involve removing and altering the sleeves too. I am student, and don’t have a sewing machine at the moment. Did you make this using a machine, or did you sew the dress by hand? And if yes, which stitch did you use? I’m an absolute novice, but would like to make this for a friend’s little girl? Whoops. It sent before I could say, thank you. This is such a stunning dress btw, too clever. I love this idea! 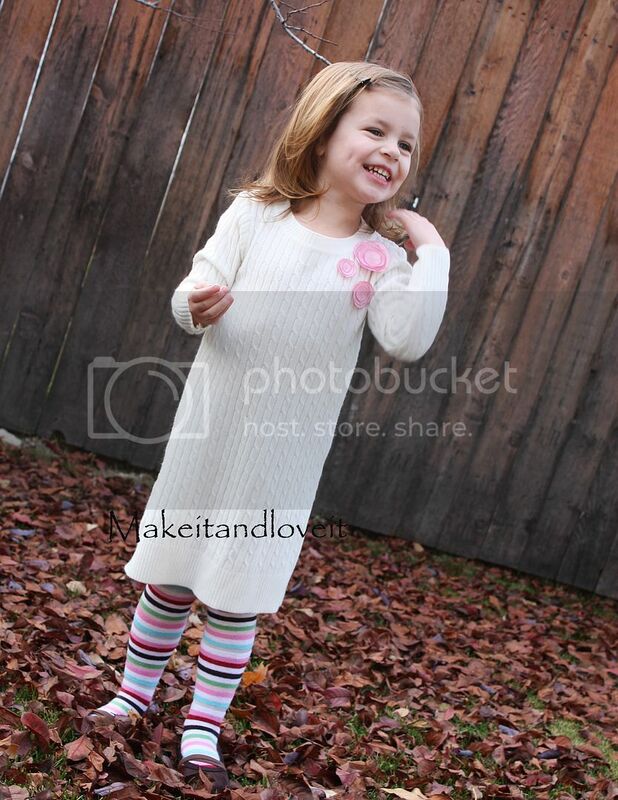 I have made 4 sweater dresses for my granddaughters they are so adorable. I made this dress for Our Little Princess. I had the exact same sweater and it came out just darling. 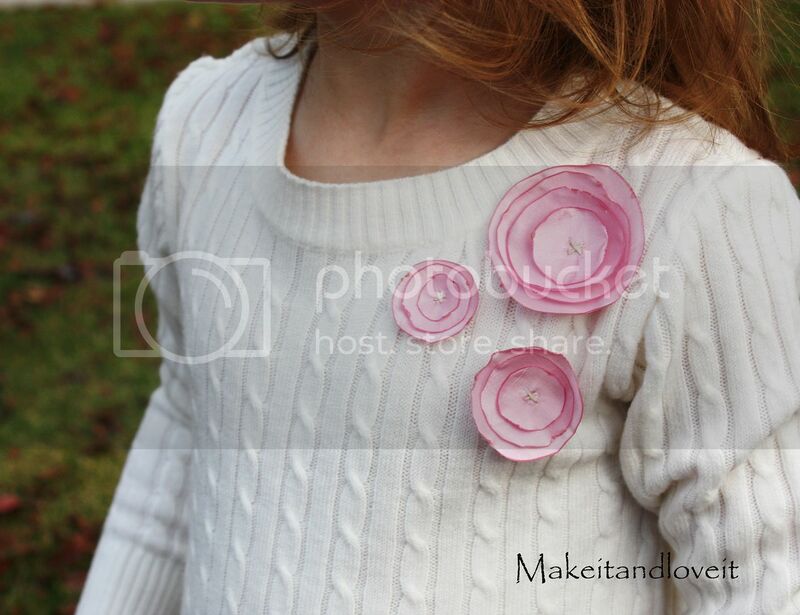 I used felt roses instead of satin flowers. Your tutorial was great and easy to follow. I posted a link to your blog and this tutorial in my post today. Saw your Valentines dress, so cute. Anyway’, can you wash the dress with those cute flowers on it? I want to attaché the flowers to a onsie and wondered how they wash. Thanks for any input. Thank you! I’ve pinned this for future projects! Adorable ideas for little ones! Thank you for sharing. Thank you for the tutorial! 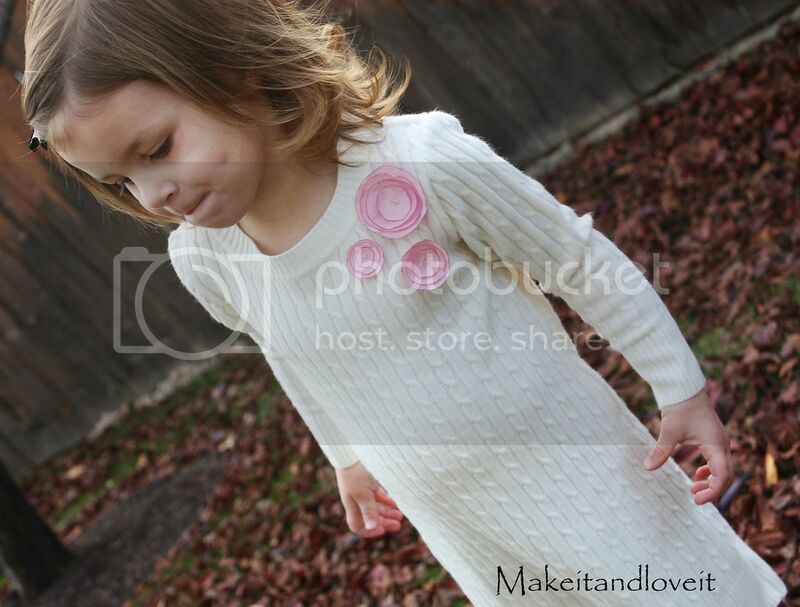 I just made an old sweater into a little dress for my daughter, and you instructions made it easy! Love it! I forsee a Goodwill trip very soon! Hmmmmmm, maybe I’ll look for a super sized men’s sweater to repurpose for me into a sweater tunic? Awesome!! I KNEW your genius would have a long sleeved and ‘big girl’ version after I saw the )adorable( one for your little one… can’t wait to make this for my girl! As the fall leaves are about to turn, the timeing is perfect! Love the dress. Did you do anything to cover the edge to prevent it from fraying? I just made my daughter one! I have been putting it off and putting it off, thinking it would be much harder to get the sizing correct. But it was a breeze! Thank you! Do you use a special type of sewing foot to sew this together. I’ve tried to sew with a regular foot and it just puckers the fabric too much. Do I need to get a special even feed dog or something? Thanks for the tutorial. 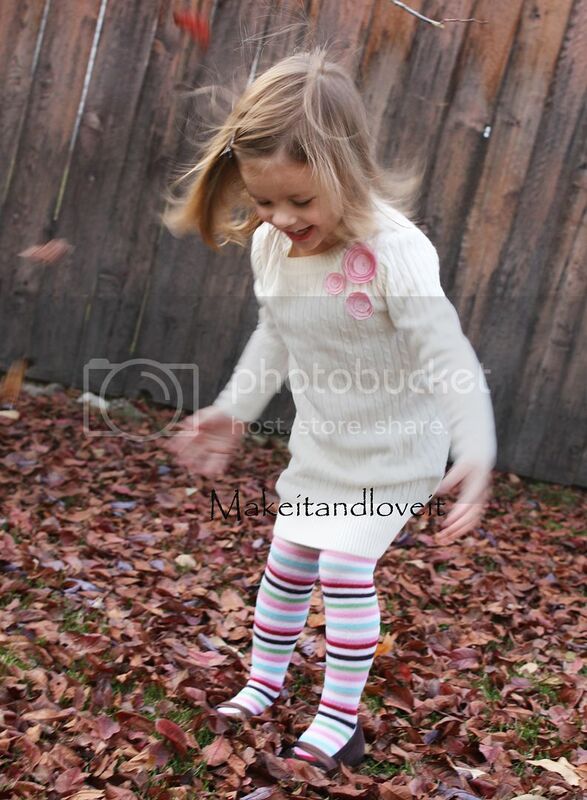 It was super easy to follow and just as easy to whip up a cute sweater-dress for my little one.